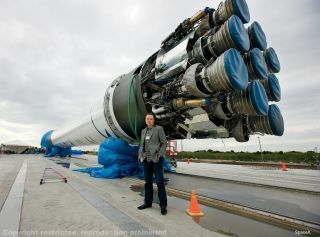 SpaceX founder and CEO Elon Musk stands next to the company’s Falcon 9 rocket. "I was just getting pistol-whipped," Musk said. "There was a lot of schadenfreude at the time, and it was bad on so many levels. Justine was torturing me in the press. ... It hurt really bad. You have these huge doubts that your life is not working, your car is not working, you’re going through a divorce and all of those things. I felt like a pile of s---. I didn’t think we would overcome it. I thought things were probably f---ing doomed." But Musk persevered, and Tesla did not go under. The company's Model S sedan won Motor Trend's Car of the Year award in 2013, and has received numerous other accolades as well. If the excerpt leaves you wanting more, you can pre-order "Elon Musk: Tesla, SpaceX, and the Quest for a Fantastic Future" now at Amazon.com.